that i had to make one for myself! 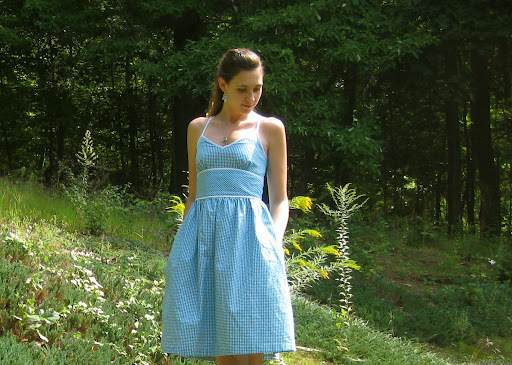 i really loved the silhouette of the bridesmaid dresses (new look 6776) i made earlier this summer and decided to use the same pattern in a different view for a shirred back summer dress. 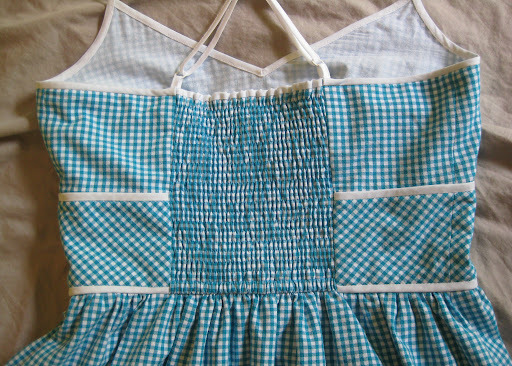 in gingham. 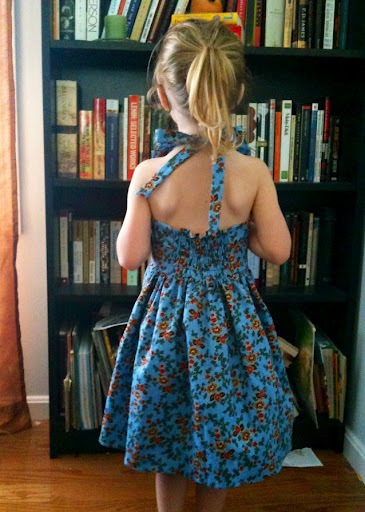 i love this dress so much… words cannot express. 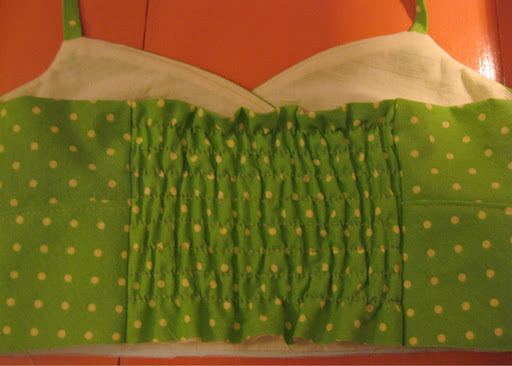 so after my first shirring experience, i made slight changes to this. 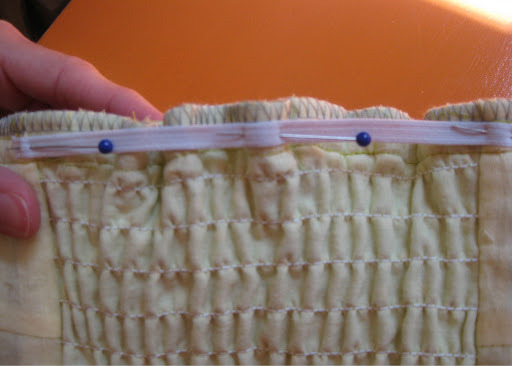 i inserted 1/4″ elastic at the top of the panel and at the bottom, out of the way of the waist SA. this worked out a little better than zig zagging in the skirt SA. 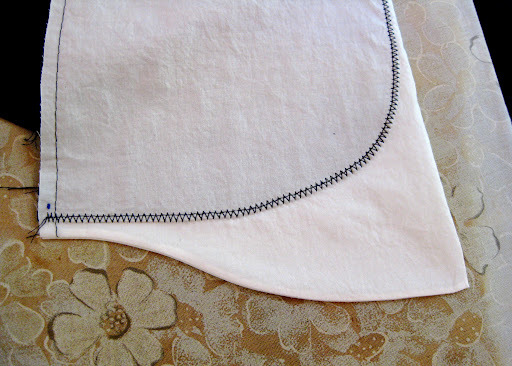 i threaded the elastic through and secured it at the ends when i sewed down the sides of the panel (see my last post). worked like a charm! in future dresses i would probably either shirr the entire back or insert a size zip. as is, it’s a little bit of a struggle to get the dress on and off. but once it’s on, it’s completely comfortable! 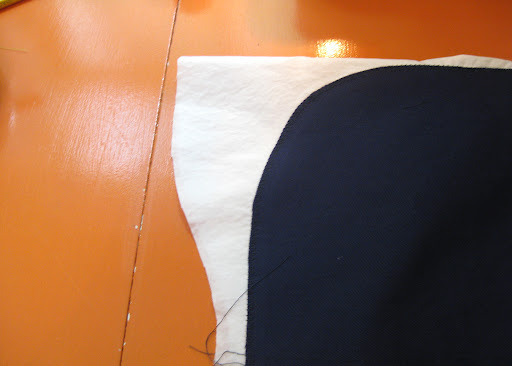 i basically just guessed how much of the back i wanted shirred, and went with about half the back width, centered obviously. after some test scraps, i determined that 5″ of material would shirr down to about 3.25″. from there it’s a simple ratio math problem: take the desired finished width times 5 then divided by 3.25. then add about 1.25″ in width for a 5/8″ SA. 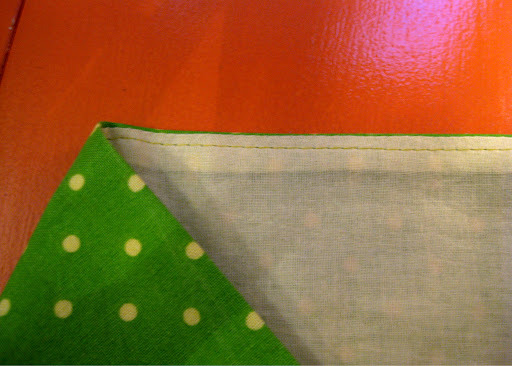 this worked for a medium weight material with a very light lining. 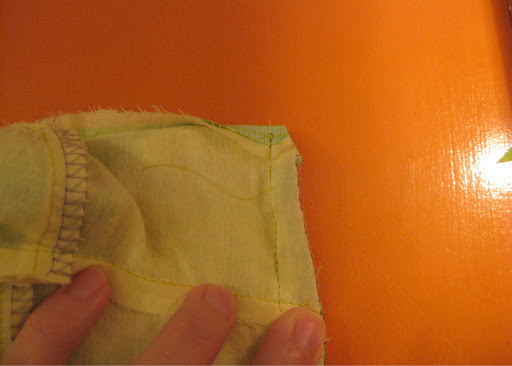 if you do this, make up a small test on scraps first. 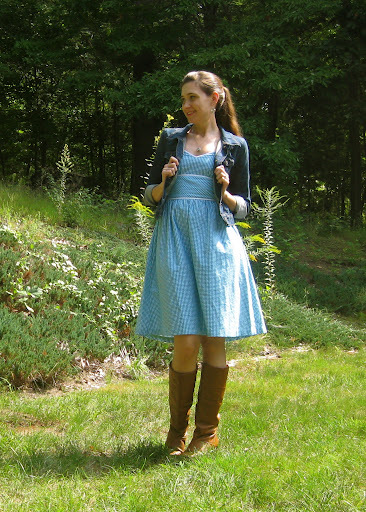 i love this dress so much i need to find a way to wear it into early fall. jean jacket and boots? oh yeah, that’ll do. 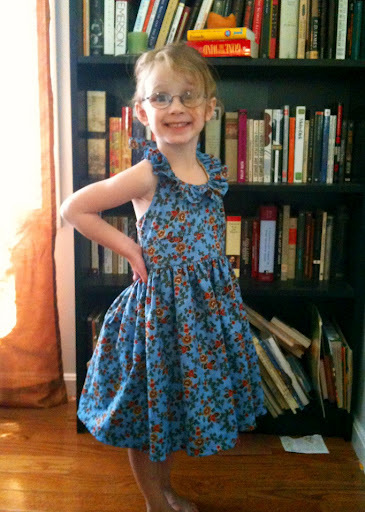 i know summer sewing is winding up, but i recently became addicted to shirring and wanted to show you how i incorporated it into dresses for two of my girls recently. 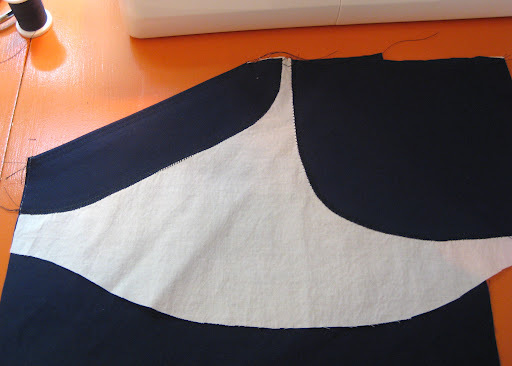 it turns out, adding a shirred panel to the back of a dress is pretty easy. 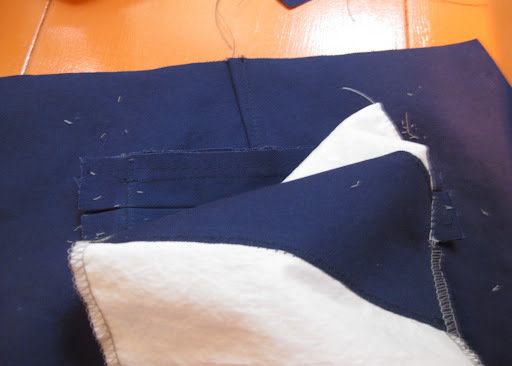 i should note, you can also make a casing at the lower edge of the shirred panel to feed elastic through instead of zig-zagging in the seam allowance. 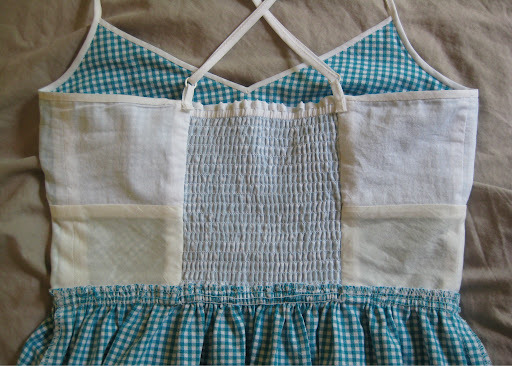 the kids dresses turned out great. so great that i decided i needed to make something similar for myself. 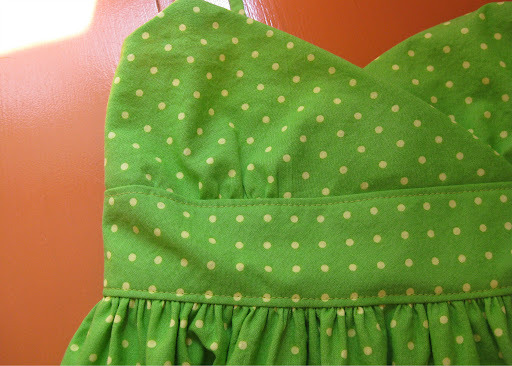 i’ll show all the finished dresses in another post because this one has enough pics as it is! okay, not really. but i just want to put this out there. i will be making a winter coat this year. i was chatting with my lovely sister who also sews and i mentioned that i need a new coat and really want to sew one this year. 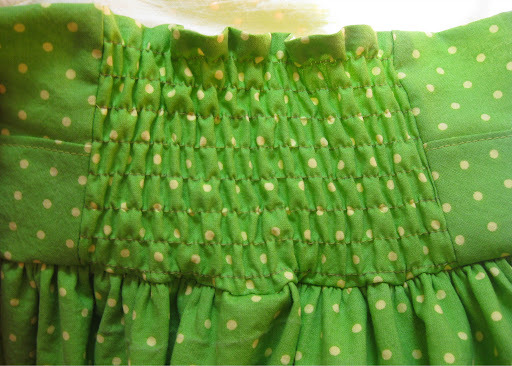 she mentioned that she also would like to make one and i said she and i can have a little sew-a-long to help each other through it. then i figured, why not take this public? 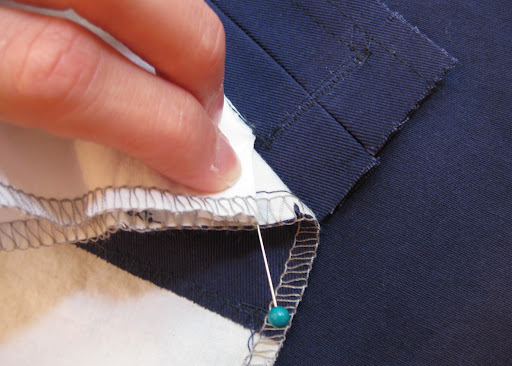 i don’t plan to offer expert advise (because i have none) but i thought if anyone else out there is sewing up a winter coat, we can all hold hands and do this together! i don’t plan to start this project until late-ish september and probably have a finished coat by mid-ish october. so if anyone is inspired to join in, i thought i’d put this out there plenty early. so there you have it. 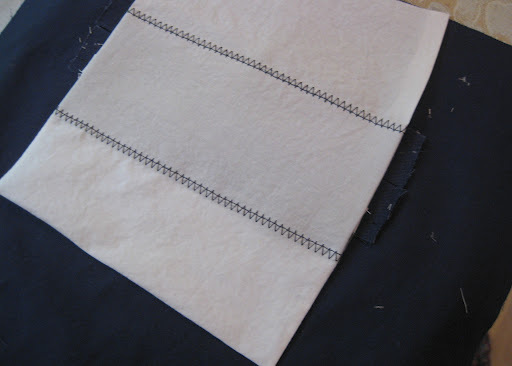 a winter coat not-quite-sew-a-long! 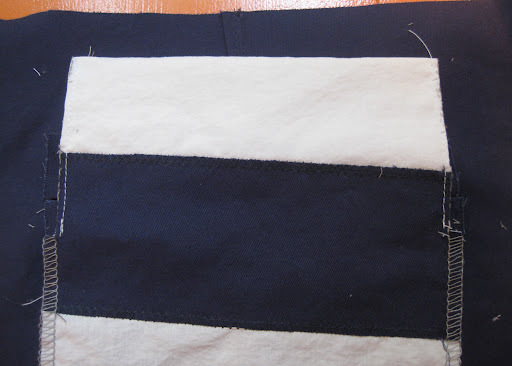 feel free to spread the message on your own blogs, i completely welcome the advice and knowledge of those who have already ventured into coat-making territory! 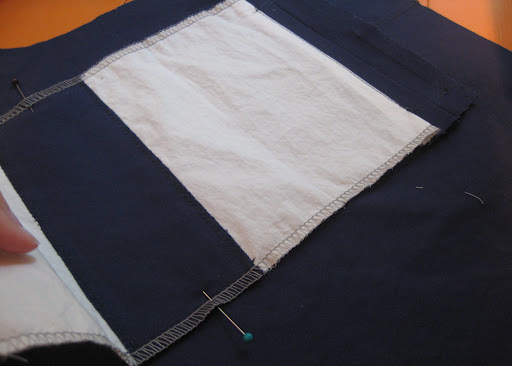 as promised, here is a simple step by step for french seaming the pocket bags on your shorts or pants. 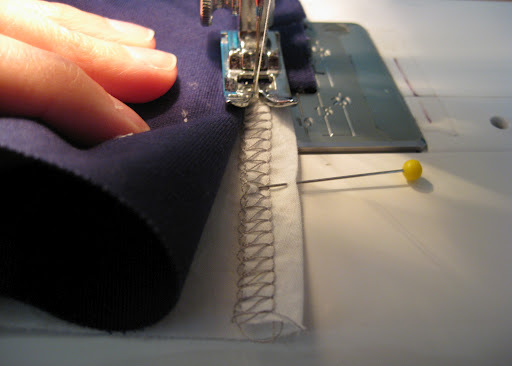 while simply finishing the edges with the serger or zig zag stitch is perfectly acceptable, the french seams make it so neat and tidy. so i see no reason not to do it this way! 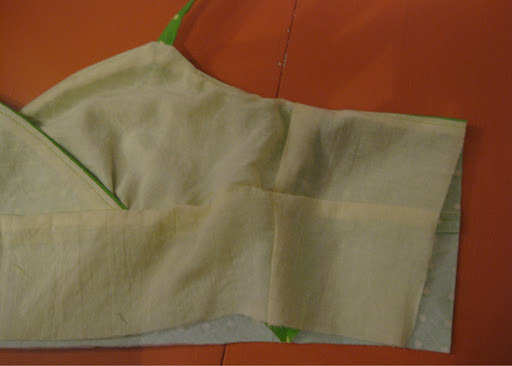 here i have the pocket bag attached, under-stitched and pressed to the inside. 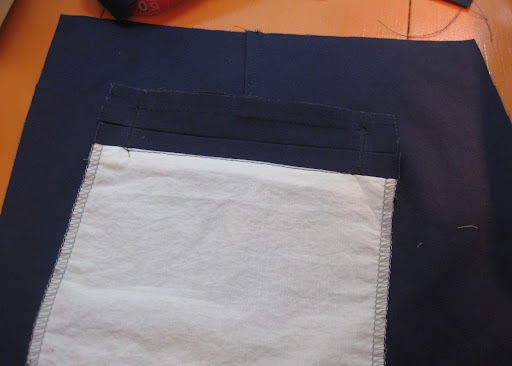 instead of folding the pocket bag to the side seam as the directions state, fold it under to line up the bottom edge with the wrong sides together and stitch the bottom of the pocket together at about 3/8″. 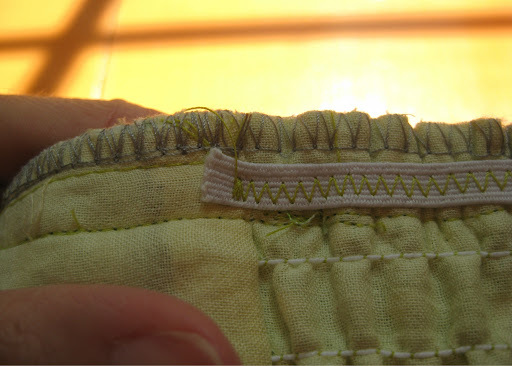 trim the seam allowance to 1/8″ then turn the pocket bag so the raw edge is inside the pocket bag and press the bottom edge. 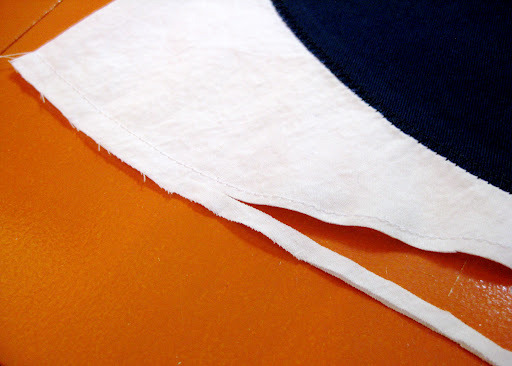 stitch 1/4″ from the edge encasing the raw edge. 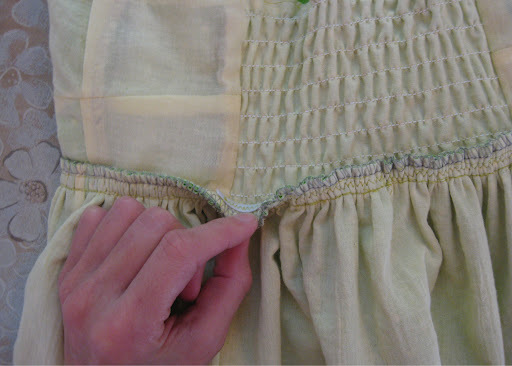 position the pocket and baste it to the side and at the waist seam as normal. 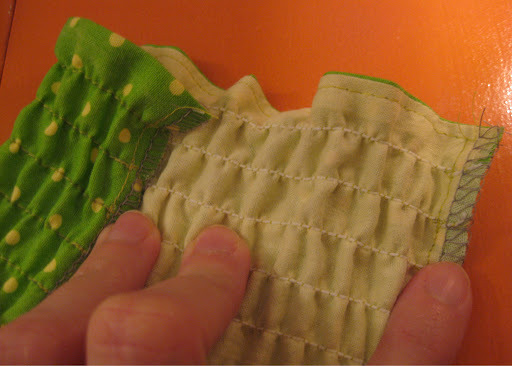 the back pocket is slightly more difficult to explain, but not hard at all to execute. if you’re having trouble visualizing how this works (even with pictures) it’s probably something that makes the most sense when you’re actually doing it yourself. 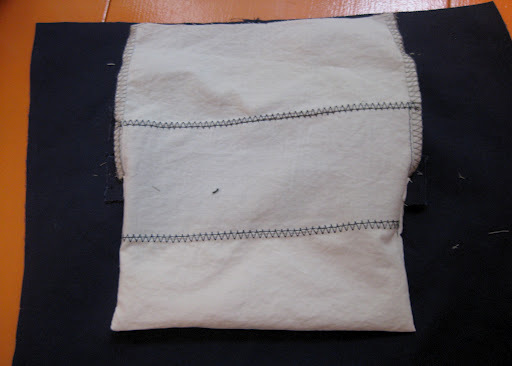 so we start off after the welts have been sewn on and the pocket bag has been stitched to the bottom welt and everything has been slashed and turned to the inside. 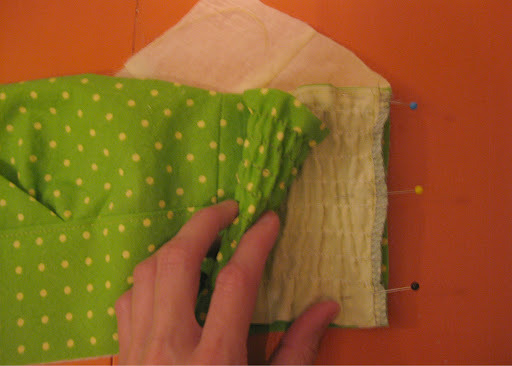 finish the side seams of the pocket bag, then press the pocket bag down. 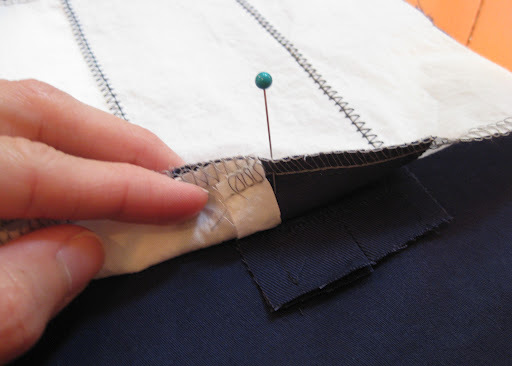 fold the pocket bag up to the waistband seam and put a pin to mark where the pocket bag edge was stitched onto the welt, as in the picture below. 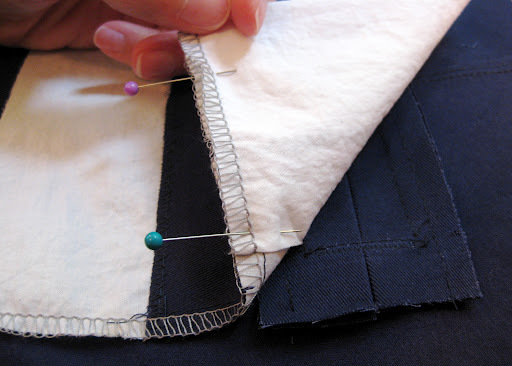 unfold the pocket bag and fold it under and line up the pin with the stitching line on the welt. 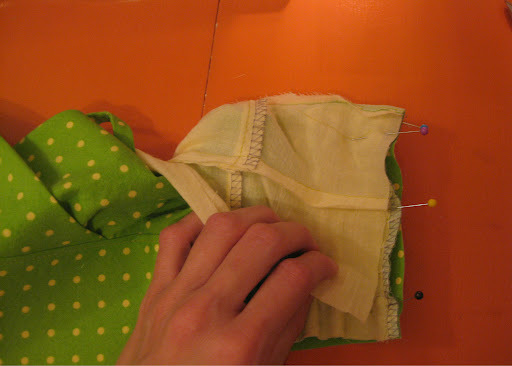 pin the lower half of the pocket bag at the side seams. 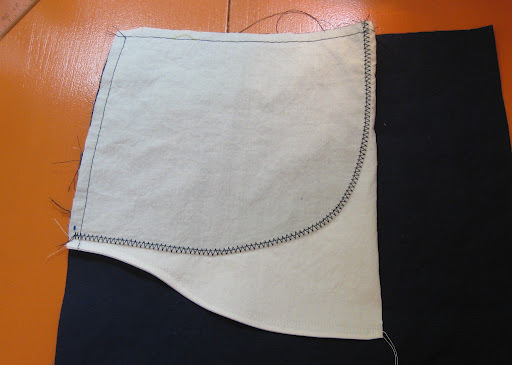 at this point the bottom of the pocket bag will be flipped up toward the waist. 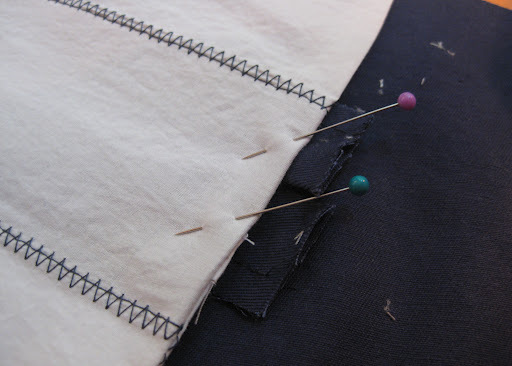 stitch the side seams at 1/4″ stopping once you reach the point you originally marked with the pin. 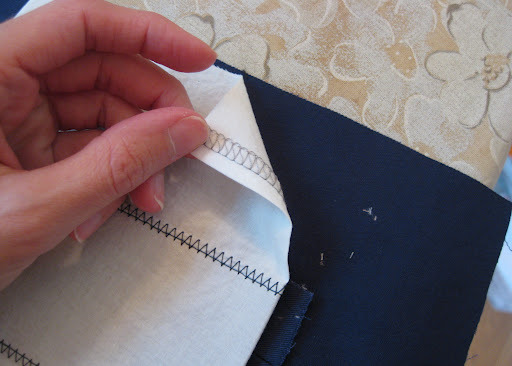 trim the raw edge down by half, stopping where you stopped sewing. see the pic below. 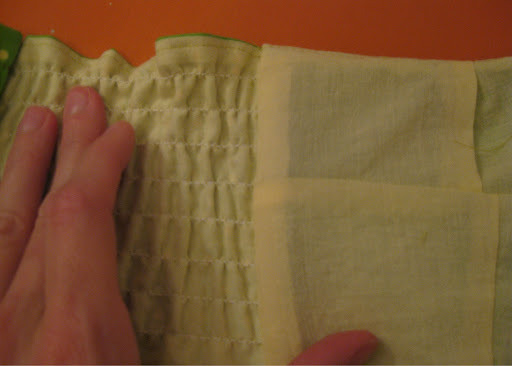 reach in and turn the pocket bag down so the raw edge is to the inside. 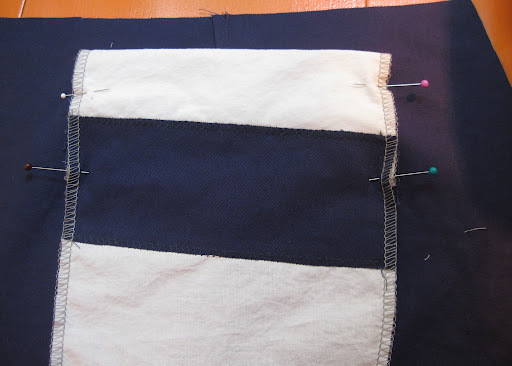 press the seams and turn the upper edge of the pocket bag in as you press so it looks like the picture below. 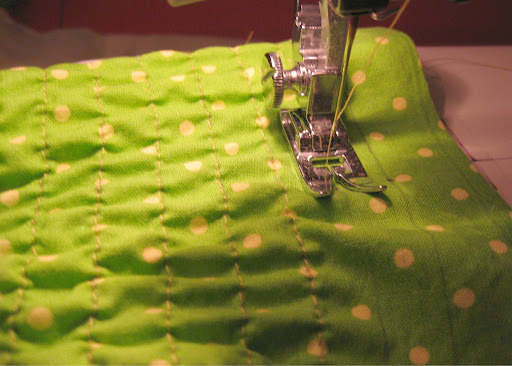 stitch the side seams, encasing the raw edge, at 1/4″ and continue stitching all the way to the top of the pocket bag. 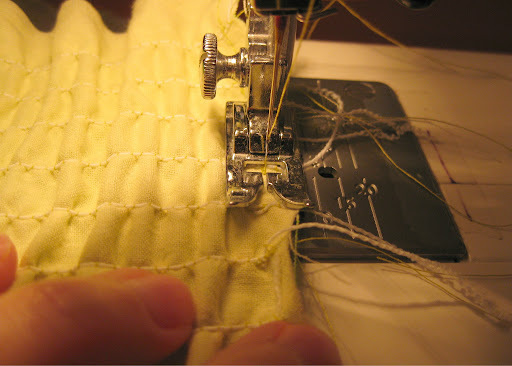 make sure you grab the ends of the welts as you stitch up the sides. 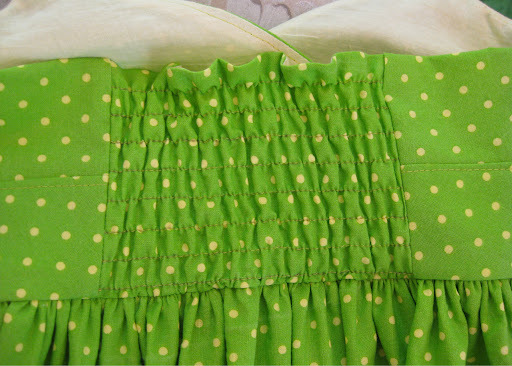 baste the pocket to the waist seam and you’re done! didn’t mean to be blog absent for so long. the family and i were gone for two weeks on vacation for my sister’s wedding and i had all these grand plans of catching up on posting my finished projects while i was away from my sewing machine… well plans were shoved aside in the flurry of wedding goings on and general sibling mayhem. yes, that wedding. 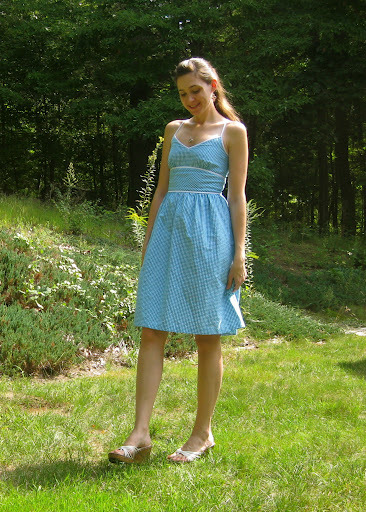 the one i expended a half-life sewing for. let me just say: the first time i saw the whole wedding party trying on their dresses and standing together in the same room (and it all looking fantastic!) i nearly cried with joy and relief! not a single alteration was necessary. 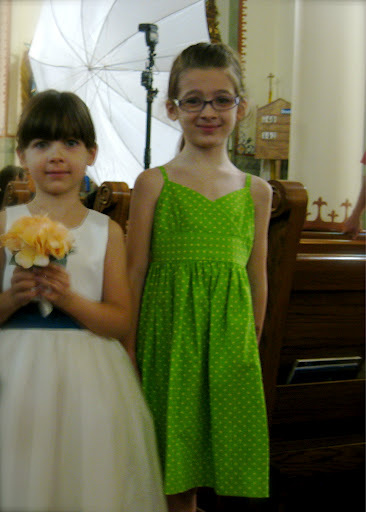 the girls all looked fabulous with possibly the best fitting dresses i’ve ever seen on a wedding party. not a particularly stunning picture, i got basically no good shots. i hope the photographer fared better than i did. i was struck by the extreme amount of talent in my family. 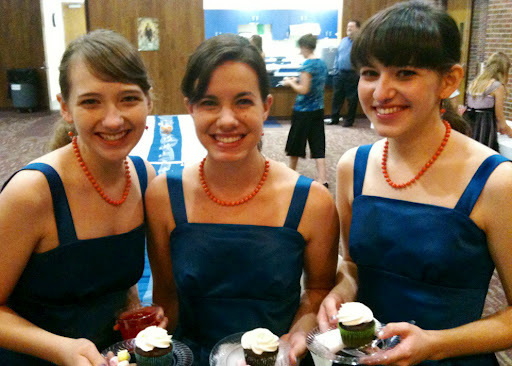 my sister rebecca (the bride) made all the flower arrangements, my sister teresa sang and played violin, my sister monica made the wedding cake and cupcakes and i did all the dresses and jewelry. what a great family event! 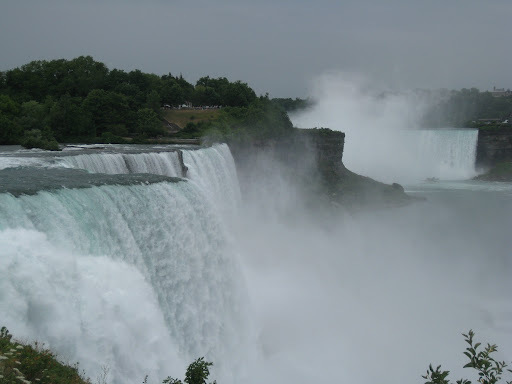 the whole trip left me completely exhausted though. 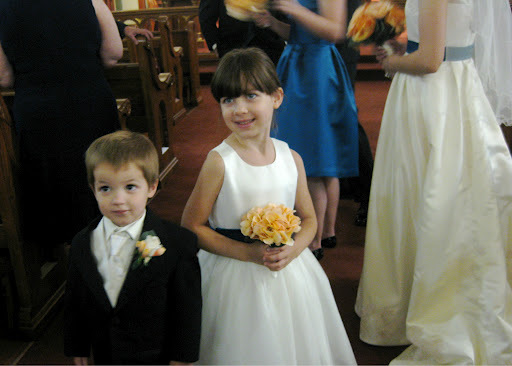 the wedding was in kansas and we live near boston. 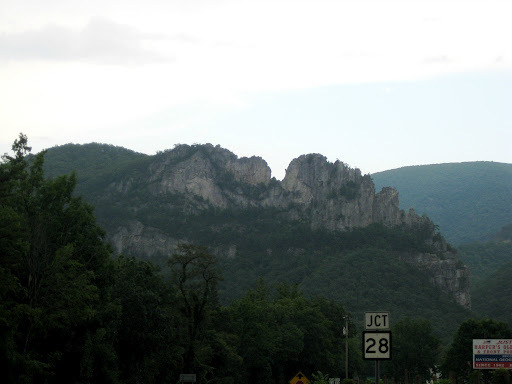 and we drove (3600 miles round trip!!!). 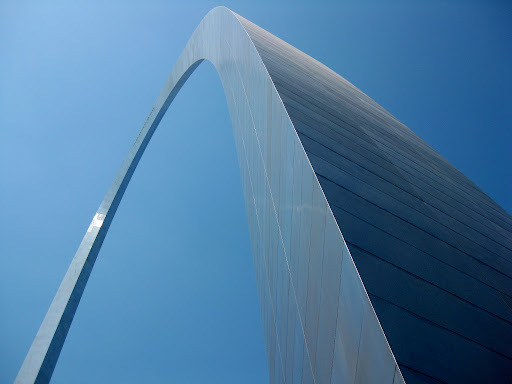 after seeing the prices of plane tickets for a family of six, we decided to make a road trip of it. 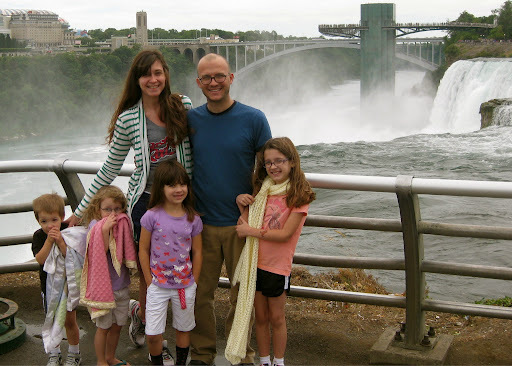 while i wasn’t particularly thrilled at the thought of driving with four young children, it was exciting to see so many amazing sights. 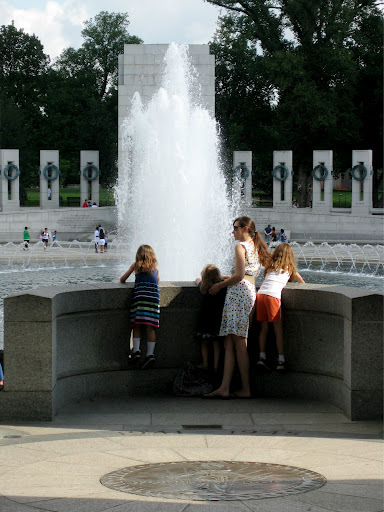 and the kids handled the long car rides spectacularly. not kidding! 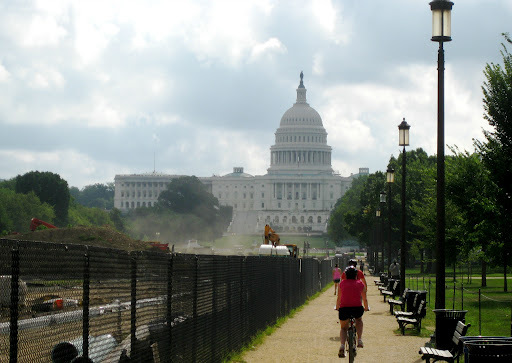 and spent a morning sightseeing in washington, dc. kansas was… well kansas. the 105-108 (F) daily temperatures were brutal to say the least. 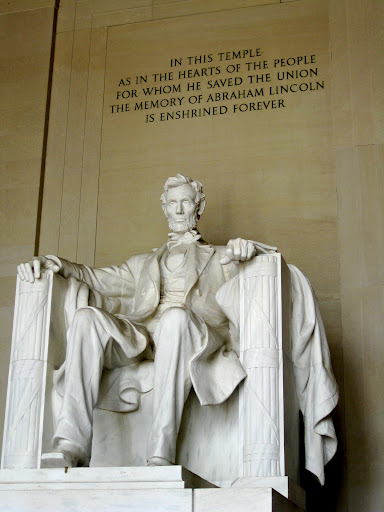 however, it was a small price to pay to get to see family and long-time friends.